[SatNews] Ben Olivier has been named President and CEO of Thales Alenia Space UK, effective today—he replaces Martin Gee, who is retiring from the company. The new President and CEO of Thales Alenia Space UK, Ben Olivier. Photo courtesy of Thales Alenia Space UK. After completing an Engineering degree at the University of Exeter, Ben Olivier started work with BAe (British Aerospace) as systems engineer and then as design manager on scientific and EO programs. During the early 90’s, Ben Olivier was appointed the marketing manager for the start-up of a joint venture with Dartcom. He then became head of the Guidance, Navigation and Control department for Matra Marconi Space. In 1999, Ben Olivier joined SEA. He started as an engineering manager and undertook roles as technical/ technology director, operations director and, from 2005, as Space Division director. Martin Gee joined Thales Alenia Space in 2013 to create a new subsidiary in the United Kingdom and to support the acquisition of SEA's space business. The progress of the acquisition has enabled the baton to be passed to Ben Olivier, previously Director of SEA's Space Division. Martin Gee will continue working for Thales Alenia Space UK moving to a non-executive role, to ensure the successful completion of actions under way to support the company's development and relations with agencies and the local business community. Over the years Ben Olivier has held a series of strategic positions in the space industry, including as Deputy Chairman of the UK National Space Technology Steering Group, board member of the Centre for Earth Observation Instrumentation, and member of the UK Industrial Space Committee. His long experience makes him a perfect fit to continue the programs already under way, in line with the UK strategy initiated by Martin Gee. 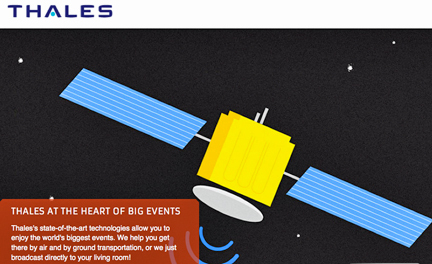 The Thales Alenia Space UK infosite may be accessed here.